It is important for an organisation to agree on what the meanings of Quality Assurance (QA) and Quality Control (QC). 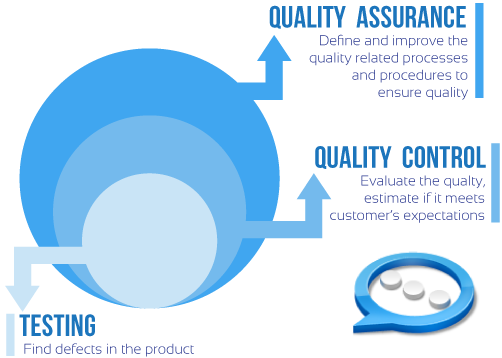 Both form an integral part of the organisation’s quality management plan, and the effectiveness of delivery teams relies on the differences being well understood by all stakeholders, including management.Our effective quality systems contribute enormously to the success of our projects and final products. Viscolloids QA is focused on planning, documenting and agreeing on a set of guidelines that are necessary to assure our highest quality. Our QA draws on both software specifications and industry & company standards. Viscolloids QA is a pro-active management practice that is used to assure the highest level of quality for our Guar products. Viscolloids Quality Control, on the other hand, includes all activities that are designed to determine the level of quality of the delivered ICT and other technical solutions. Teams will use, amongst other techniques, structured walkthroughs, testing and code inspections to ensure that the solution meets the agreed set of requirements. Financial rewards for the company, which are a consequence of new projects from existing and referral clients, as well as through the reduction of monies spent on rework tasks. As the company’s quality management plan matures, the confidence of all stakeholders will grow. Viscolloids will be as effective and efficient as possible in delivering a unique high quality Customized Guar product.